We dream, like so many people, of a world in balance. A world where people feel connected to eachother and to Mother Earth. A world of unity, peace, respect, solidarity and equality. For three times we have organized an International Peace Festival at Centre Lothlorien. A festival with a strong focus on sharing wisdom and strenghtening our connection. Our desire to organize a worldwide gathering that with a call for action, that would really make a difference towards a world in balance, continued to grow. Don Alejandro, the president of “The Continental Council of Indigenous Elders and Spiritual Guides of America” who has visited one of the peace festivals at Lothlorien, saw in a ceremony that the did sacred fire was to be brought to Europe. To base the 6th Gathering of the Council in Europe. The five previous gatherings all took place on the American continent. It includes both the association of “The Eagle” (North America) and “The Condor” (Central and South America). Their collaboration was announced in the prophecies of the Mayans and Hopi. Promotors came together and a journey through Guatemala through special spiritual places followed. The common goal to achieve lasting action for the next generations led to a serious intent to jointly organize a major world gathering at Centre Lothlorien. A few months later, the council decided it was not feasible to come up with 300 people to Lothlorien in 2017. However, members of the council participate along with this Human World Summit, it will not be the 6th Gathering. Let yourself be inspired by our dream of Unity and act on it. 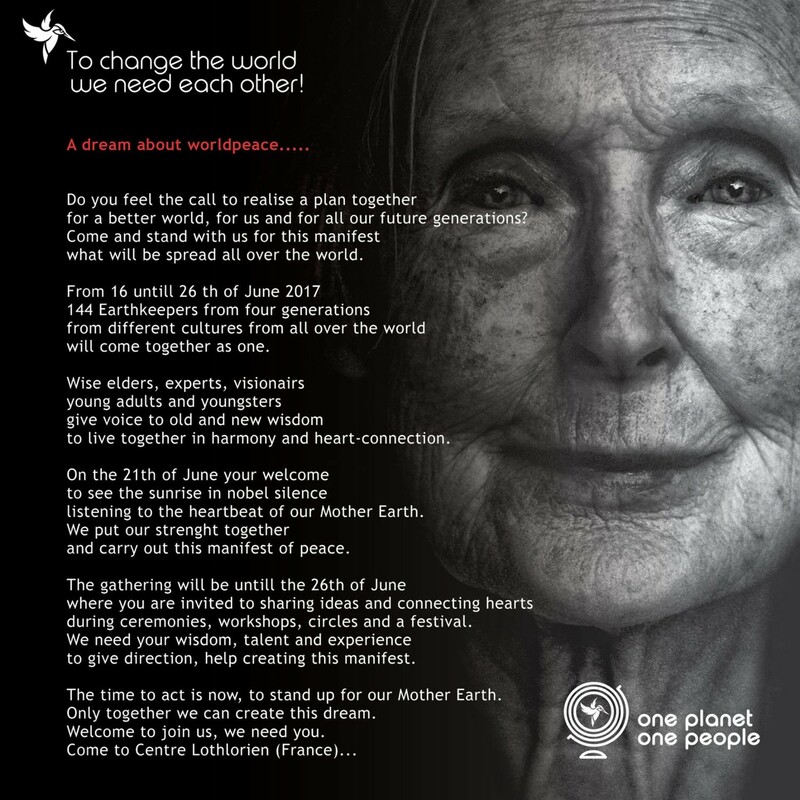 Come to the One Planet – One People Human World Summit at Centre Lothlorien in June 2017, to share your action, to begin your own initiative or join one of the many existing projects to make the world a better place. World peace starts with yourself!